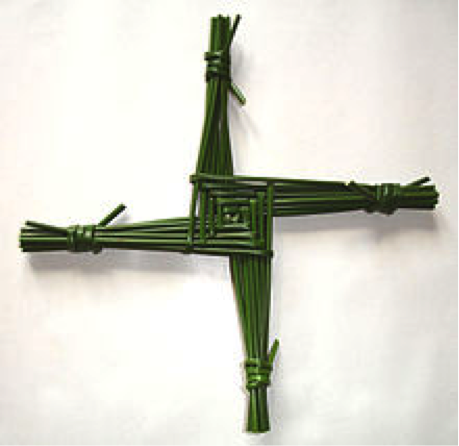 Brigid – known also as Brigit, Bridget, Brid, Bride – is a patroness of Ireland, along with Patrick and Columba. Her life mirrors a huge cultural shift during the 5th and 6th Centuries, when Christianity was introduced to the pagan clans of Medieval Ireland. There is a tale in which Brigid is asked by friends to visit a dying pagan chieftain. He was delirious in his illness and they hoped she could calm him. As she sat by his bedside, she picked up some rushes from the floor (common in those days to keep the room warm and clean) and started weaving them together into the shape of a cross. As she wove, she explained the meaning of the cross to the sick man, who grew quiet and listened. Soon his fever broke. The story of love she told him, the Christian story, so captivated the chieftain, that he was baptized just before his death. Brigid’s cross of rushes gently bent her natural surroundings into the shape of her faith – just as Brigid wove the people and culture of Ireland into a Christian people. Born to a pagan chieftain father and a Christian slave mother, Brigid’s family included the two communities that she bridged through her life and work, teaching pagan Ireland how to embrace a new faith, while keeping it’s unique cultural character. Christianity came to Ireland, not through political power, but through individual acts of faith and storytelling by people on the underside of history. Born a slave, Brigid spent her life helping the poor. Many of the miracles attributed to her are tales of feeding the hungry, giving away worldly goods, and being mysteriously rewarded for her generosity. When, as a child, she gave away all her mother’s butter, it was replenished three-fold. She kept a secret store of clothes and food for the poor and in one story even gave her father’s treasured sword to a leper. Brigid showed how her Christian faith incorporated elements that were valued among her pagan neighbors – respect for the natural world and strong bonds of kinship. She is most notable for forming religious communities that became centers of prayer, charity and learning for both women and men. It was from these tightknit communities that early Irish Christians reached out to the rest of Ireland. I’d make the men contented for their own sake. From all the parishes around. There by the lake of beer.